Guitarist Brian May is to spend two days studying the night sky in the Canary Islands as he completes the PhD he abandoned in 1971 to join Queen. May is going to La Palma to observe the formation of "zodiacal dust clouds". The subject forms the basis of a thesis for London's Imperial College, where he had been studying before deciding to pursue a career with the rock group. 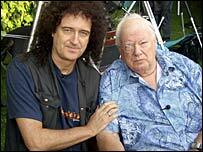 The 60-year-old recently published a book on astronomy with The Sky at Night presenter Sir Patrick Moore. May is basing himself at the Observatory of the Roque de Los Muchachos on the island of La Palma. A statement issued on behalf of the facility said he had chosen this location because of the "quality of the sky" and the opportunity to use a 3.6-metre optical telescope, "which allows astronomers to study extremely faint objects". May is also preparing a concert to mark the inauguration of another telescope at the observatory. He will present his thesis, which he has been preparing for across much of the past year, to Imperial College "within a fortnight". A number of academics will question him about his work before any doctorate is awarded, a spokeswoman said.